This is how small the world is: A year ago, during my very first weekend in Scotland, I was sitting with friends in tiny Rosslyn Chapel (if you’ve seen “The Da Vinci Code,” you’ll know how famous it is) when I suddenly spied a face I knew. It was a woman I hadn’t seen in some years — a food and fashion blogger in Atlanta whom I’d met at my “A Tiger in the Kitchen” book signing at the Decatur Book Festival in 2011. 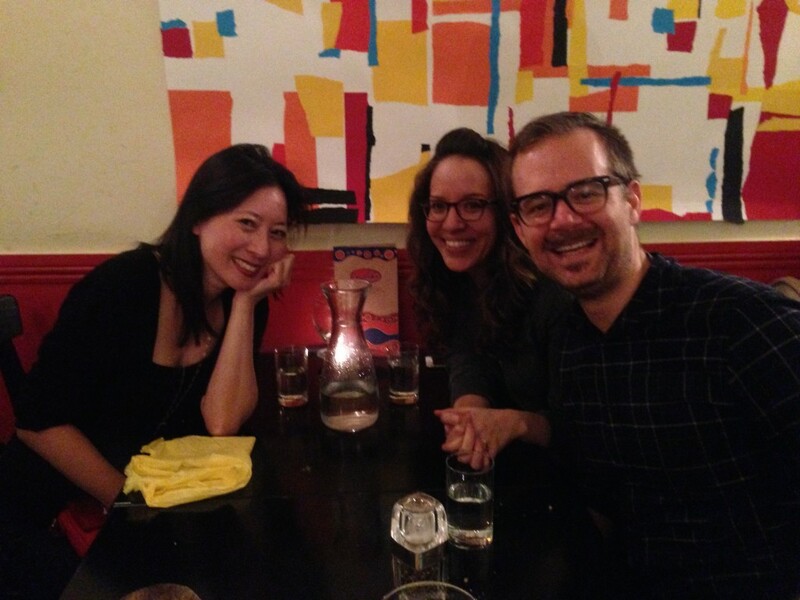 Lauren — or Lar — and her twin sister Cath, who write the Asian Cajuns blog, are just about the most effervescent, sweet and gorgeous bloggers (and people) I’ve met. And of all the churches in the world, Lar and I had somehow wound up in this little rural affair in Midlothian, Scotland, on the very same day. 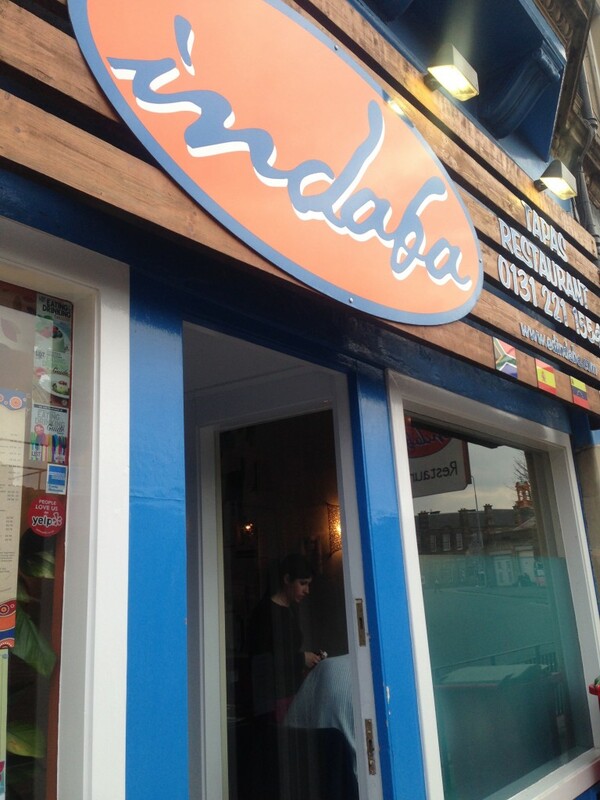 Indaba is eclectic, to say the least — the name means “meeting” in Zulu and it’s a true meeting point for several cuisines: South African, Venezuelan and Spanish flavors comingling on tapas plates. 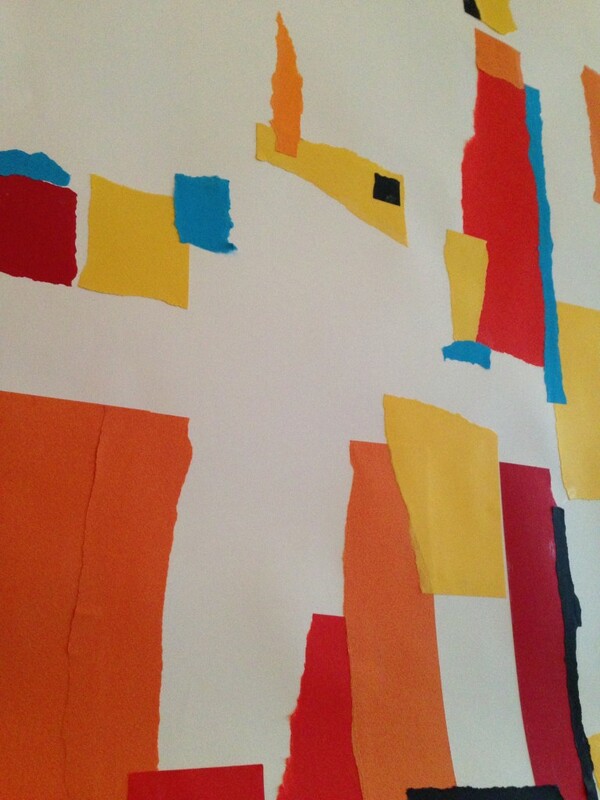 And the walls were filled with gigantic collages, a temporary show by local artists John Nowak and Marion Barron. Even with a sizable menu, there was the added impressive list of specials that night. The arepas (Venezuelan maize-based flatbread, often filled like a sandwich) are a specialty of the house. I loved that they had a Scottish version, filled with haggis by MacSweens, one of the noteworthy haggis makers of Scotland. 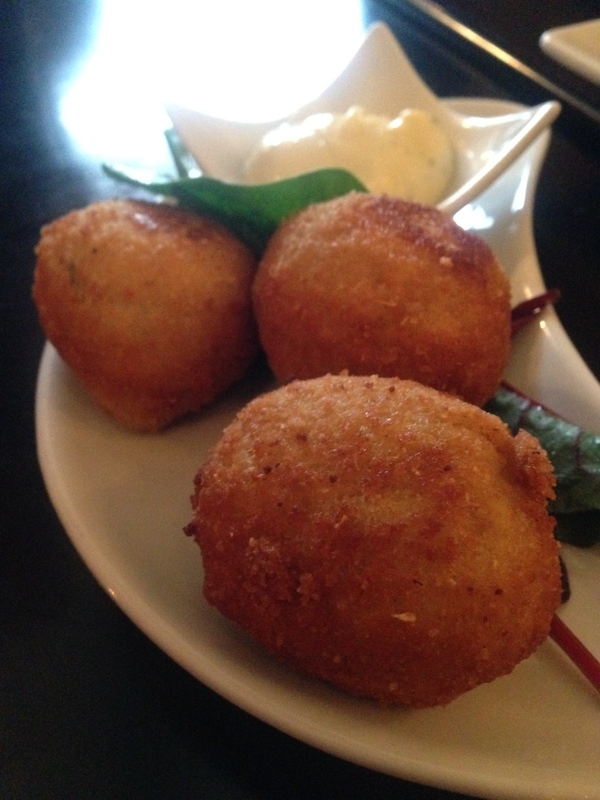 First up, the bacalao croquettes (£5.95), which arrived piping hot and deliciously salty and oozy on the inside. 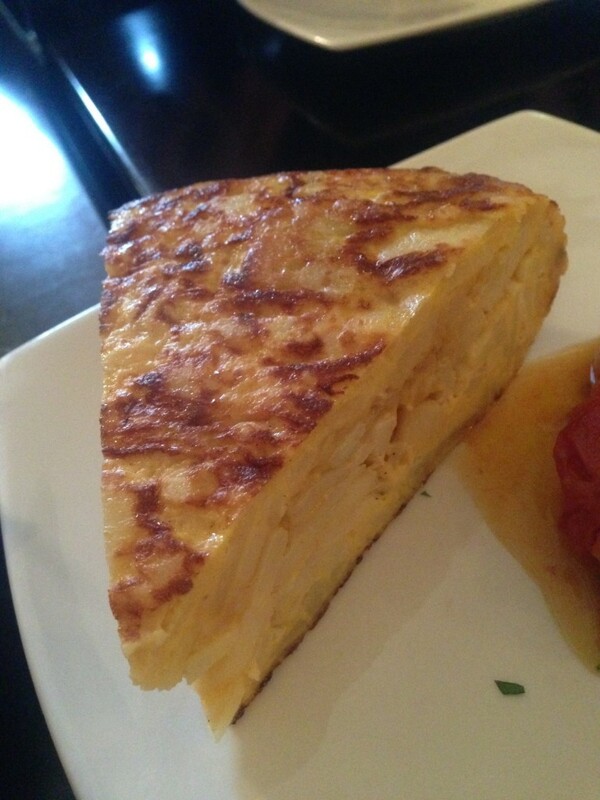 Tortilla Espanola is one of my absolute favorite things, so of course we had to order that. 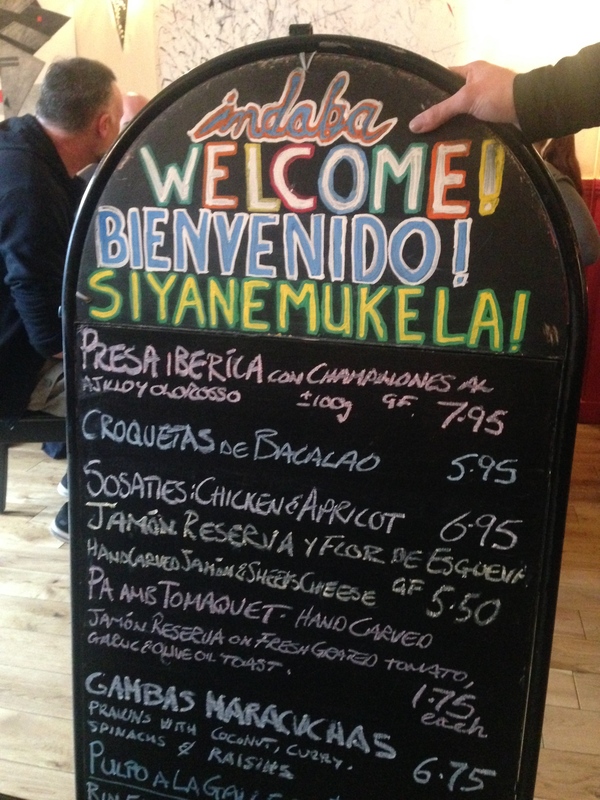 Indaba’s (£4.75) came with a spicy vegetable stew, which worked very nicely with the onion and potato omelette. As much as I love traditional haggis, I also am a fan of the vegetarian versions, which tend to be very amped up on spices, probably to overcome the lack of that hearty offal flavor you get from the meat. This version (£5.50) was slightly different from ones I’ve had, which are sort of like a vegetable-flavored grainy meal. 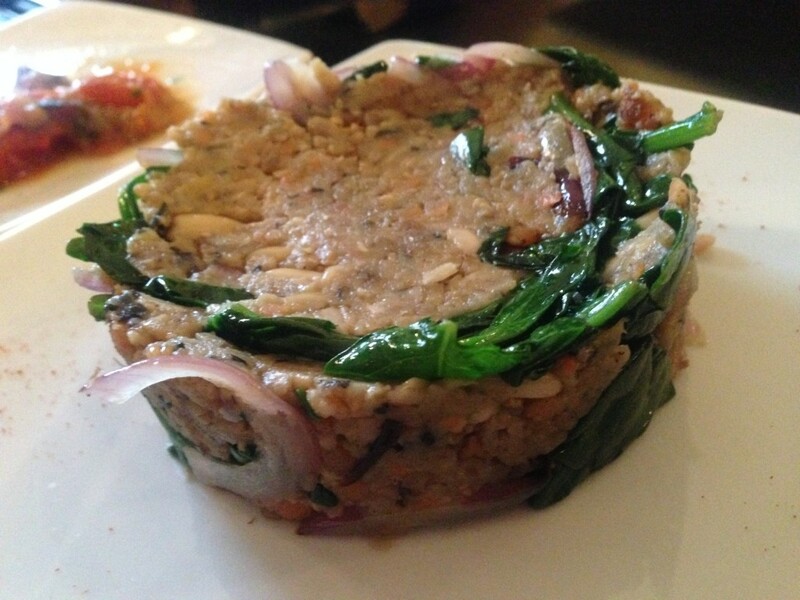 Packed with onions, pine nuts and large spinach leaves, this hockey puck-sized cake was incredibly filling. 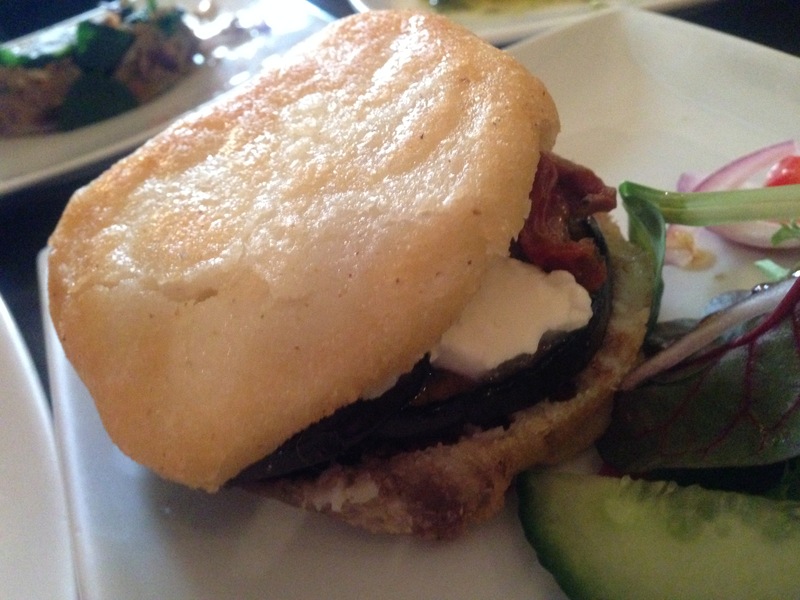 Lar adores the vegetarian arepas, among which her favorite is the aubergine, sundried tomato and cheese version. Very tasty. My favorites though, were ones I didn’t quite expect. 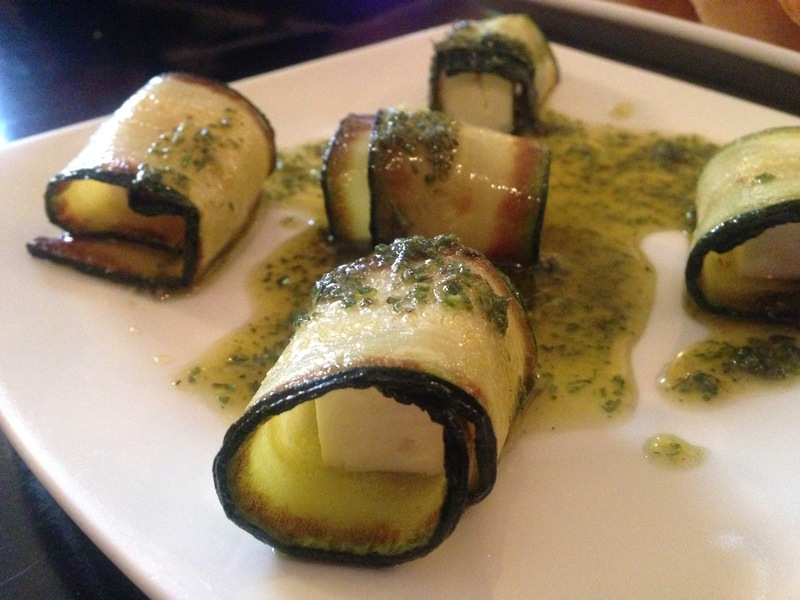 The rollitos de calabacin (£4.75; pictured up top), courgette strips wrapped around feta cheese cubes and drizzled with rosemary olive oil, were beautiful little flavor bombs. I loved the juiciness of the courgettes paired with the creaminess of the cheese and the herbed oil was a delicious finisher. 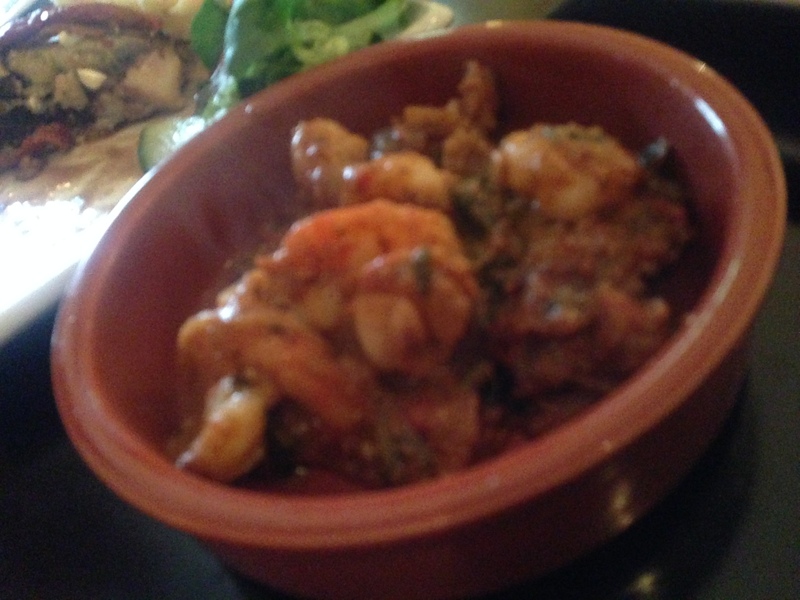 I’m not the biggest prawn lover but these cooked in a coconut, spinach and raisin curry (£6.75) were outstanding. The spices in each bite were so complex and intense. 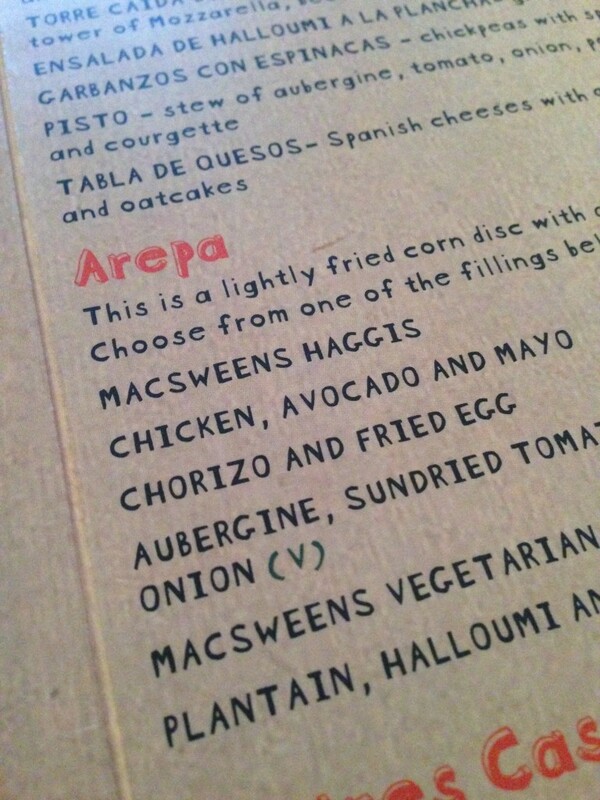 Of course, we had to have the haggis arepa, which was very nicely done. 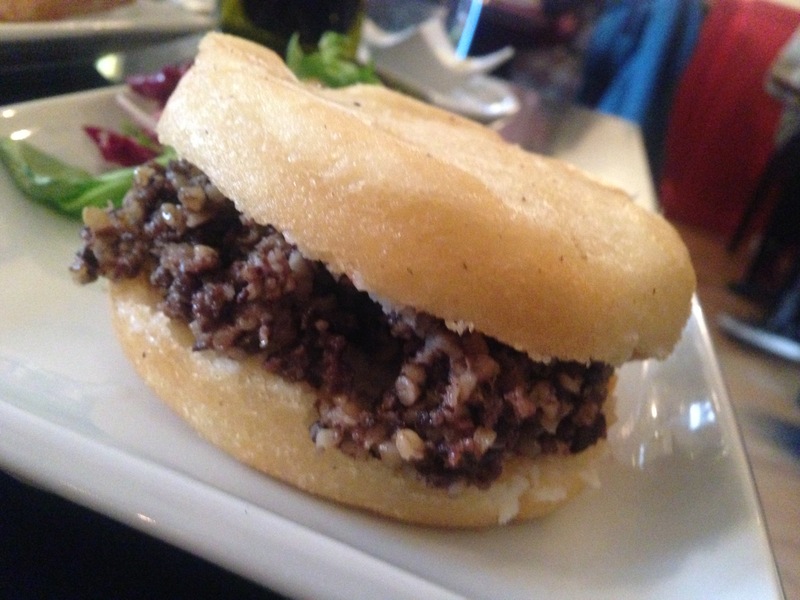 The arepa was hot and crisp and the haggis was deliciously earthy and meaty. I could eat this every day. 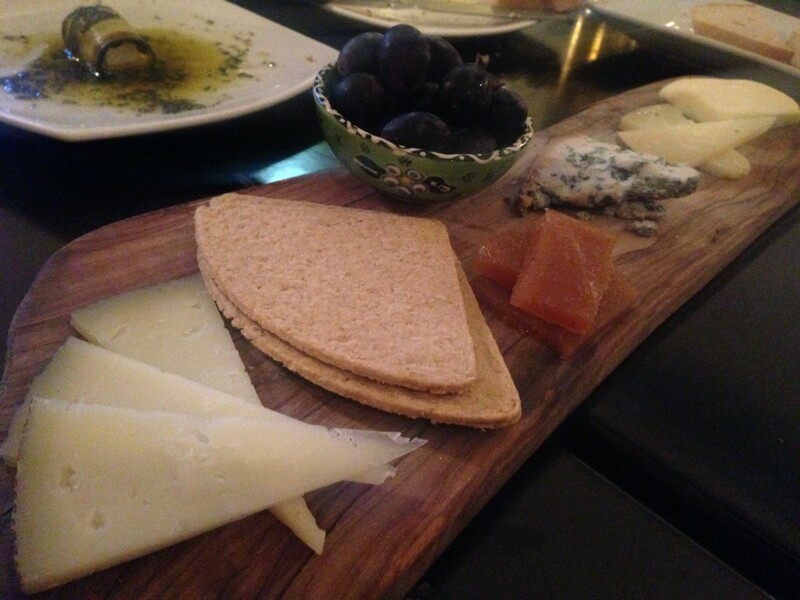 After all that, there was no room for more but a platter of Spanish cheeses with quince jelly, grapes and oat cakes (£7.95) arrived and we couldn’t say no. So, cheers to good eats! 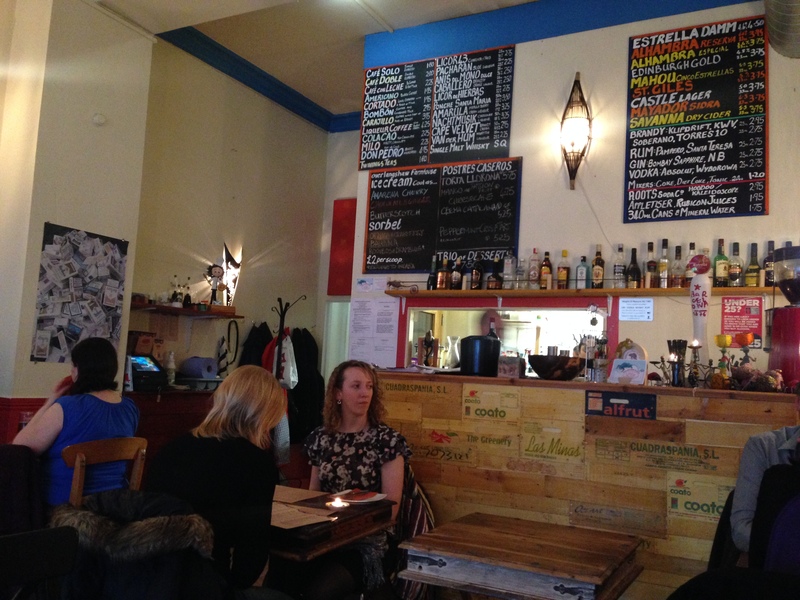 And to chance meetings in places where you’d least expect them.